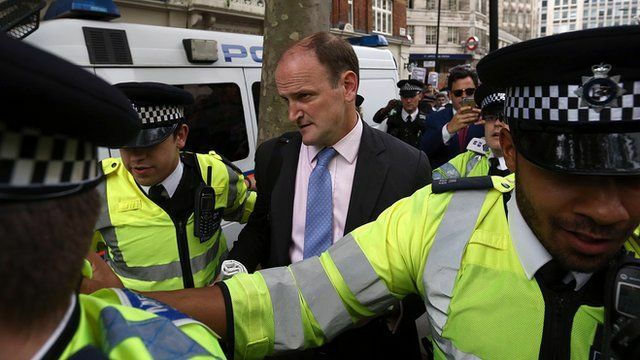 UKIP MP confronted by protesters Jump to media player The UKIP MP Douglas Carswell has been confronted in the street by anti-austerity protesters near Westminster. Queen's Speech sets out new legislation Jump to media player The Queen has opened the first session of the new parliament, setting out the legislation the Conservative government wants to pass this year. The UKIP MP Douglas Carswell has been confronted in the street by anti-austerity protesters near Westminster. Mr Carswell was verbally abused in the confrontation and had to be escorted by officers to a police van and driven away. The MP was stopped by demonstrators at St James Park tube station, who chanted abuse at him and an assistant.